Above: an assortment of photos from the varied film career of Britain’s major Hollywood star, Kate Winslet, including scenes from Titanic, her initial breakthrough into the big-time, with Leonardo DiCaprio, and (bottom) in A Little Chaos with Alan Rickman, who directed the film and also played King Louis XIV. HER most recent major film, the period drama A Little Chaos, released last September, co-starring and directed by Alan Rickman, received a somewhat mixed reception from the critics, but I don’t suppose Kate Winslet was all that bothered. For Berkshire-born Kate is, after all, one of the most bankable British stars in Hollywood ever since she sprang to fame with her appearance in Titanic with Leonardo DiCaprio. Thrice-married Kate’s love life has occupied acres of space in the tabloid newspapers, but her family history is somewhat less colourful. However, I was intrigued to come across a great great aunt in the censuses who was a barmaid called, would you believe, Kate Winslet! Several generations of Kate’s ancestors were publicans in Reading, the largest town in Berkshire, and she must be Reading’s most famous export. 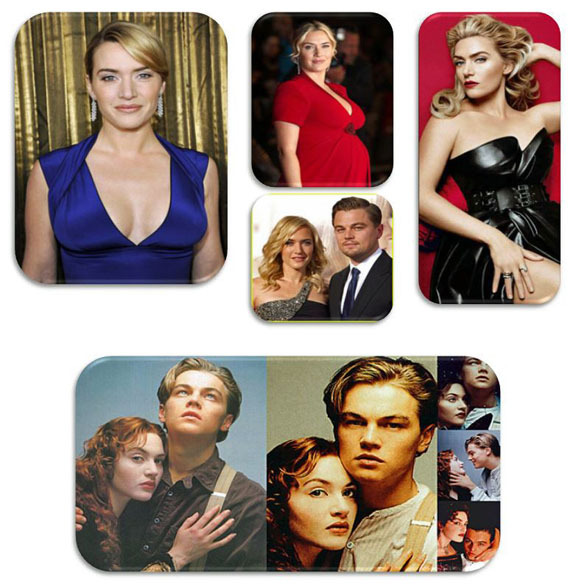 She was born Kate Elizabeth Winslet, on 5 October 1975, the second of four children of Roger John Winslet, a swimming pool contractor, and Sally Ann Bridges, a barmaid, who were married at Reading in 1968. She has an older sister Anna, younger sister Beth and a younger brother Joss. Anna and Beth are actresses also but with much lower profiles than their glamorous and famous sister. Kate’s parents were both ‘jobbing actors’ but had to do a variety of other jobs to survive. Kate Winslet has said in interviews that she didn’t have a privileged upbringing and that the family’s daily life was ‘very hand to mouth’. However, she has a theatrical background because her maternal grandparents, Oliver and Linda Bridges, ran the Reading Repertory Theatre. Kate’s father, Roger, was born at Reading in 1939 not long before the outbreak of World War II, the son of Charles John Winslet, who worked in men’s clothes shops, first as an assistant and then rising to be a manager, and Blanche Sims. The couple were married at Reading in 1932. Charles Winslet, Kate’s grandfather, was born in 1908 and he is found aged two in the 1911 census, along with his parents, Charles and Emily Mary Winslet. The family were living at 21 Great Knollys Street, Reading, with Charles senior’s occupation shown as a licensed victualler. The pub he kept is not named in the census but a 1914 commercial directory for Reading reveals that it was called the Lion (see page extract below). Kate’s great grandfather Charles Winslet senior was aged 38, his wife 37 and they had been married four years. Their son, aged 2, appears in the census with his forenames reversed as John Charles Winslet (it is fairly common to find forenames reversed in different records). Also living with them was Charles senior’s elder sister, Sarah Emma, a single woman aged 40. Both she and Emily Mary gave their occupations as ‘Assisting in Business’. All four members of the family gave their birth place as Reading. I found the marriage at Reading in the marriage indexes of the General Register Office for England and Wales, in the June quarter of 1906, of Charles Winslet and Emily Mary Wells. A decade earlier in the 1901 census, a then unmarried Charles was aged 23 and helping his father, John Winslet – Kate’s great great grandfather – at another pub in the centre of Reading at 9 High Street. Again, the name of the pub was not given in the census but a directory of 1899 shows that it was called the Broad Face (see photo below). 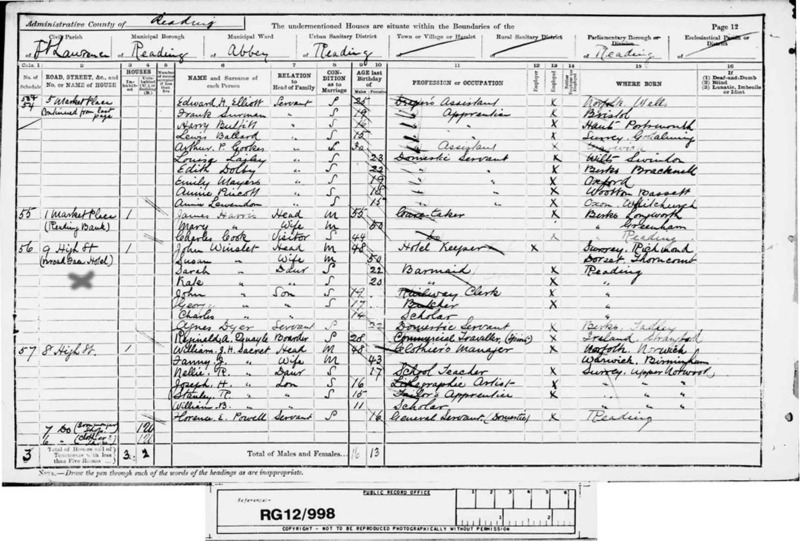 In this census John Winslet was 58 and gave his occupation as hotel keeper and his birth place as Richmond, Surrey. He was a widower, his wife, Susan or Susannah having died in 1897 aged 60. It was clearly a family business, since John had two daughters and two sons all helping him. The elder daughter, Sarah, 31, was the house keeper; another daughter Catherine, 29, was a barmaid; son George, 26, was a barman; and the younger son Charles, 23, was the cellarman. All the children had been born at Reading. The ages of Cha rles Winslet (senior) in the censuses of 1901 and 1911 – 23 and 38 respectively – don’t add up. Some re-checking in the GRO birth indexes showed that he was born at Reading in 1877 and his wife, Emily Mary Wells, was born there in 1871. Could Charles have been embarrassed by the fact that Emily was a few years older than him and decided to make himself older in 1911? It seems the only feasible explanation! The Winslet family were also at the Broad Face Hotel (this time it was clearly named) in the census of 1891. John, 48, was the hotel keeper, born at Richmond, Surrey, while his wife Susan, two years older than him at 50, gave her birth place as Thorncombe, Dorset. There were five children in this census: Sarah, 22, barmaid; Kate, 20, barmaid (yes, she is actually named as Kate Winslet); son John, 19, a railway clerk; son George, 17, a butcher; and youngest child Charles, 14, scholar, all born at Reading. Also in the household were a 22-year-old servant, Agnes Dyer, born at Tadley, Hampshire, and a male boarder of 28, Reginald Quayle from Ireland. The 1891 census of the Broad Face Hotel, High Street, Reading, with John Winslet, Kate’s great grandfather, as the hotel keeper and John’s daughter, a 20-year-old barmaid and Kate’s great great aunt who was also called Kate Winslet (marked with a cross). In the census of 1881 John and Susan Winslet were at a different pub called the Railway Tavern, 33 Greyfriars Road, Reading. John’s age is incorrectly given as either 32 or 52, which is an enumerator’s error or a mistranscription or both. The image is difficult to read because one of those annoying diagonal, black lines made by the checking clerks has been drawn through it. Susan Winslet, his wife, was 40 and again her birth place was given as Thorncombe, Dorset. Daughter Emma was 14, Kate 12 (again she was enumerated as Kate Winslet), and Charles 4. The two older sons, John and George, were not at home but were found as pupils at a boys’ school at Whitley Park, Whitley Road, Reading. John Winslet and Susannah Phillips were married at Reading in 1868 and by the 1871 census they had already taken over the Railway Tavern in Greyfriars Street, where they were found also in 1881. In this census the surname is spelt with a double ‘t’ as Winslett. John was shown as 27 and Susan as 30, while daughters Emma and Kate were aged 2 and 0 respectively. Also in the household was 15-year-old Ellen Winslett, John’s niece. With the family was a single female of 27 who was enumerated as Harriett Phelps, but I suspect this should have been Phillips and she was Susan’s sister because her birth place was also given as Thorncombe, Dorset. Also found in the 1871 census were John Winslet’s parents, Thomas and Priscilla Winslett (again spelt with a double ‘t’). We will come to them shortly in earlier censuses, but by 1871 they were living in alms houses called Hickey’s alms houses at Richmond, Surrey. Thomas was aged 68 and Priscilla 69 and both gave their birth place as Richmond. 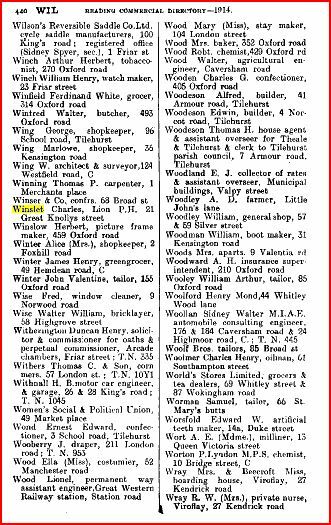 I was unable to find Thomas and Priscilla in 1861, however, I did find a very interesting entry for their son, John Winslett [sic]. He was a servant, aged 18, in a household in Richmond Road, Twickenham, Middlesex, and also working as a servant there was his eventual bride, Susan Phillips, aged 23. There seems little doubt that this was the woman who became John’s wife since her birth place was given once more as Thorncombe, Dorset. The household was headed by one Alberic D Willoughby who was described in the census as ‘The Honourable Gent’ and about whom I found an interesting piece of history! Some extensive Googling revealed that he was an aristocrat who became Baron Alberic Drummond Willoughby de Eresby and in 1868 he was involved in a scandalous court case in which he cruelly tried to cut himself off from a French countess who had lived with him as his wife for 17 years and by whom he had a daughter, leaving her more or less destitute. Returning to the Winslets, I found Thomas and Priscilla in the 1851 census at Old Worple Way, Richmond, Thomas being then 49 and a dairy man and Priscila also aged 49, both being born at Richmond. With them were two sons, Charles 14, John 7, and a daughter Ann 6, all born at Richmond also. In 1841 Thomas and Priscilla were at Marsh Gate, Worple Way, Richmond, Thomas being a milkman. They had seven children: Samuel 15, Richard 12, Adelaide 10, Thomas 9, William 7, Charles 5 and Sarah 3. My researches were not yet quite complete, for I found in the International Genealogical Index (IGI), compiled by the Church of Jesus Christ of Latter-day Saints, the marriage of Thomas Winslet to Priscilla Tasker on 7 December 1824 at the church of St Mary Magdalen, Richmond. Thomas and Priscilla were the great great great grandparents of Kate Winslet, Hollywood movie star. I looked for the birth or baptism of Thomas and believe I found his birth in the IGI on 13 December 1803 at Richmond, the son of Richard Winslett [sic] and Mary. Finally, I found in the online parish registers of St George, Hanover Square, in central London, a marriage for Richard Winslet and Mary Grant on 29 June 1794. However, more research would need to be done to establish for certain whether they were the 4x great-grandparents of Kate Winslet. Findmypast (http://www.findmypast.co.uk/) a major genealogical website which carries all the census records and images from 1841 to 1911.